It does not grant 100% fire chance, it depends on how many enemies are trying to kill you and lags. Also it has false fire on duels and other events where something saves your life. 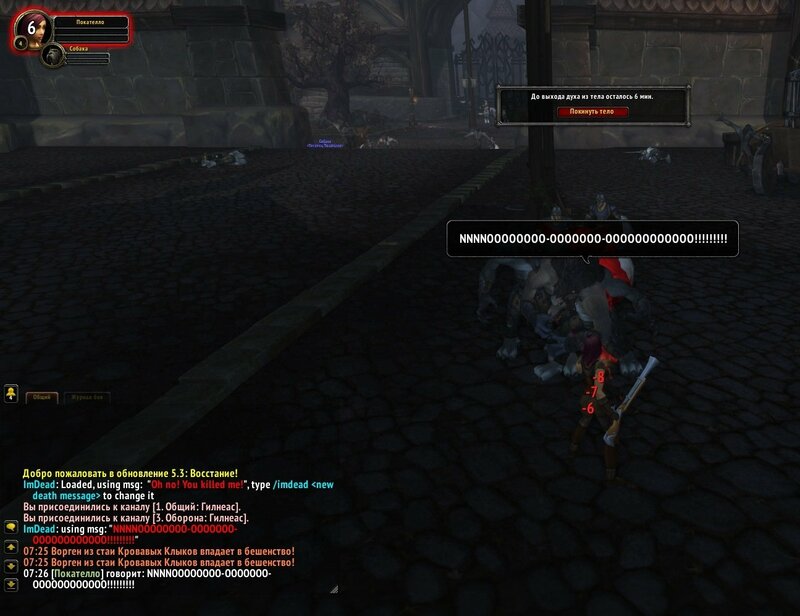 An easy addon, that tryes to send your custom message to the channel (say, yell or emote) before your death or defeat. Scaning the combat log for incoming damage, if found overkill value then bam, you are dead, it`s time to try say something before your "say channel" will be locked in case of your death or defeat. /imdead channel <say,yell,emote> to switch the channel. "[Cheat Death] I don't sell my soul to devil, money isn't my religion !" It's very good for tell at your healers to heal u ! So, thank u for this very good addon ! Last edited by Ripsyn : 01-06-14 at 08:09 AM. Last edited by AlleyKat : 08-06-13 at 01:11 AM. What about the DK death absorb talent It say something also if you are not dead (Tested) I think mage will have the same problem with Cauterize. Last edited by Tonyleila : 08-03-13 at 06:18 AM.